The earthquake in Napa registered over 6 around 3:20 this morning. I woke and felt the house sway back and forth as though it were tossing in a stormy sea. I wondered if this was it, the time of reckoning, the end of it all. Would the walls collapse? Would the gas water heater explode? The epicenter – Napa – turned out to be a ways away from our town, but close enough that we felt the quake’s strength in our East Bay community. But the quake was a reminder of our human fragility and a reminder of time running out. We checked for damage and found none apparent, so we trundled off to church to pray for those hurt, to pray for our raging world, to become one with one another and God in the Eucharist, and later to celebrate a parishioner’s birthday (ninety-nine!) with a festive lunch. As I knelt in the oak pew, I recalled today was the Feast of Saint Bartholomew, one of the twelve apostles, thought to be the same as Nathaniel, brought to Christ by the Apostle Phillip. I saw suddenly in my mind his beautiful church in Rome. In the middle of the Tiber on an island the shape of a ship stands the ancient church of San Bartolomeo, Saint Bartholomew. I have long loved this church, for its setting amid the rushing waters and leafy banks as well as for its graceful vaults running up side aisles, its colorful apse. But when I enter and pause at the foot of the central aisle to gaze up towards the high altar, I invariably smile. Altars in Christian churches have been sanctified by the bones of the martyrs since the earliest days when women cleaned the saints’ bodies and buried them outside the walls of Rome. It had long been the custom for pagan Rome to visit their dead and remember them on their anniversaries with outdoor suppers over their graves. The custom continued with the Christian martyrs, a custom that evolved naturally into something more than a memorial meal. For the holy bones seemed to work miracles. So when Christianity became legal, it was natural to build churches over these graves, to celebrate with holy suppers of thanksgiving, Eucharists, and when these sacred relics were threatened by eastern invasions they were brought inside the city walls for safety. Thus throughout the Christian world altars are sanctified by the relics of the martyrs, relics placed beneath in what is sometimes called a confessio or witness to truth. 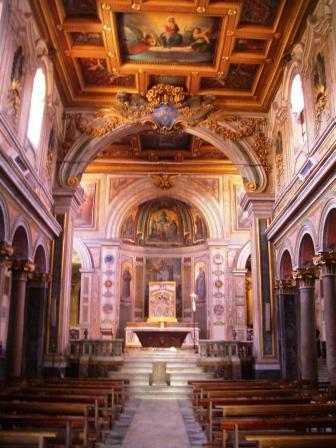 Saint Bartholomew, Apostle, lies under the altar of San Bartolomeo in Rome on the Tiber Island, in a large boat-shaped reliquary that bears the altar table above it. There is something earthy about this dark sarcophagus in this bright and lofty church, so I often experience a frisson of joy, seeing this union of Heaven and earth, which of course, is the action of the Holy Eucharist in each Mass that will be celebrated on that altar. Little is known of Saint Bartholomew whom Christ describes as “without guile,” meaning ingenuous, honest. Bartholomew had asked whether anything good could come from Nazareth. He soon had his answer; he recognizes Christ for who he is; he is present at the Ascension. It is said that he preached in India and Armenia, where he was martyred, flayed and crucified upside down. His relics found their way from Armenia to Rome and were placed under the altar of St. Adalberto, now to be called San Bartolomeo. When we visit San Bartolomeo in Rome we usually come from the Aventine Hill, descending along the stone path from the gardens of Santa Sabina, following the river walk under the plane trees, the waters rushing below. Soon the island comes into view, and we cross an old stone bridge, the Ponte Fabricio, to the Isola Tiberina. In ancient Rome a temple of healing stood here; a hospital remains today. We enter the marbled and gilded Romanesque-Baroque church and, after pausing at the foot of the central aisle to view the the tomb holding the high altar, we visit the side chapels. In 2000 Pope Jean Paul II dedicated these altars to the martyrs of the 20th and 21st centuries. Each chapel recalls regions and regimes where Christians died for their witness to truth, to Christ: Asia, Oceana, the Near East, Latin America, Africa, Communism, Nazism, Spain and Mexico. The Community of San Egidio, a lay fraternity of men and women who pray for peace and care for the poor in Rome, look after these memorials. In many ways this church embodies the resurrected church of today, one reborn again and again in the blood of these modern martyrs, one intensely full of the Holy Spirit, of suffering. And as I worshiped in my own parish church in the Bay Area this morning, I thought of this Apostle without Guile, this Apostle of Truth, Saint Bartholomew, who was not afraid to witness to God becoming Man and living among us, dying for us, rising for us, with us. Such a witness, seen in the Basilica of San Bartolomeo on an island awash by the tumbling waters of Rome, is encouraging. We too are awash in such dangerous tides that threaten to flood our parish naves. We too sail in an ark of faith and we too pray for the courage to witness. 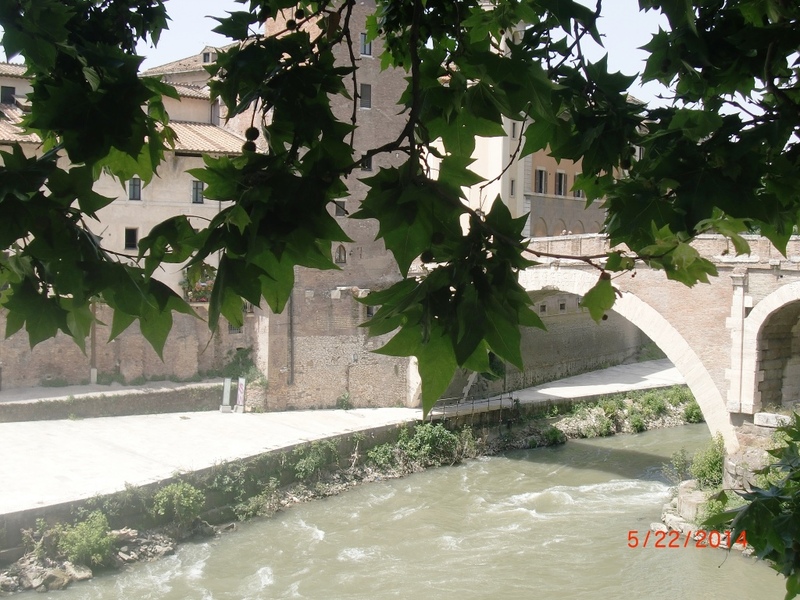 I set a scene on this island in my first novel, Pilgrimage, and a more dramatic scene on the Ponte Fabricio in my recently released novel, The Magdalene Mystery. Both novels are about truth and healing, about navigating dangerous waters in arks of fa ith, about allowing the past to inform our present through the lives of saints and martyrs. Thank you, San Bartolomeo, for being without guile. This entry was posted in Uncategorized and tagged altar, Bartolomeo, Christ, death, earthquakes, Faith, life, relics, Rome, sacred, Tiber, truth, witness. Bookmark the permalink.